There were some differences. This new one was located on the other side of Vegas at the Wetlands Park Preserve in Henderson and I was able to address some of the lighting issues with serious use of the foot zoom. I probably followed this particular bird for 40+ minutes desperately trying to get an angle that cut down on the harsh sun while still giving a relatively clean path to the target. Linda can probably give you the exact time down to the second I spent trying to get a decent shot of this bird in the tin. When she found out I already had it I think she threatened to take the Beast and beat me over the head with it – thank god I can run faster than her. She calmed down a bit when I informed her my original shots left a lot to be desired and was just trying to give my readers a better experience…okay, I lied, that did nothing to calm her one bit. 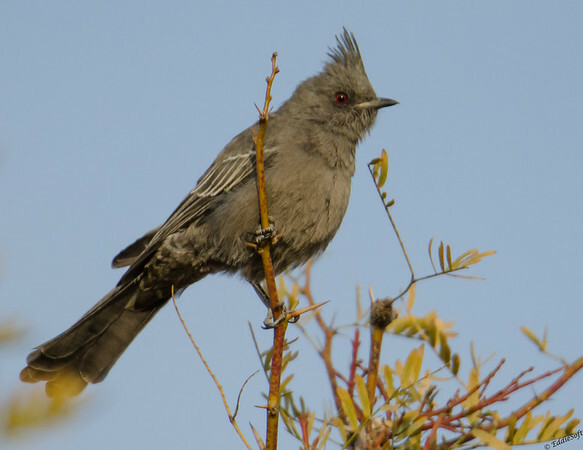 Hey, there’s another similarity – I also lied in my first post when I said Phainopepla was Latin for Evil Cardinal. As I cleared up in that post, the name is really Greek for Shining Robe. 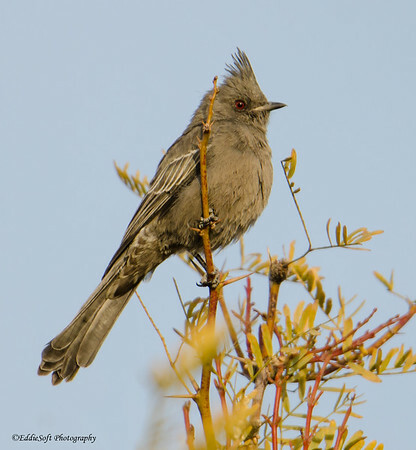 In case you are asking yourself how that name applies to this specimen, it is named after the male adult plumage. The females have the more drab grey. 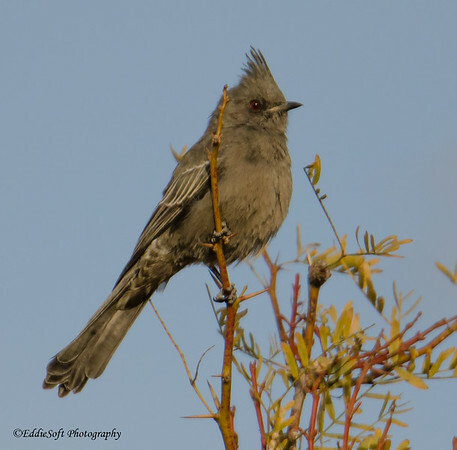 Both the adult male and female have a red eye and the spiky crown – the punk rocker of the birding community. I still think they look a bit evil and might have to consider putting a few of these out on our annual haunted trail. As I mentioned, getting this female in the tin was a definite chore. At first we couldn’t locate it. I’d hear a fairly high pitch whistle then a fairly loud twill coming from the thick bushes. Then I would hear a wurpy like call coming from a different area. I’d run over there only to have it turn back into a high whistle and in some cases something completely different. Extremely frustrating not being able to pinpoint the source of the calls. All of sudden it flew out and over to the top branches you see in the photos. That is when I discovered all those sounds were coming from the same bird. According to Cornell, their songs have over 14 different parts and when pursued by humans can mimic the calls of other birds. Clever bird, but not clever enough to evade my shutter. Getting a clean shot ended up taking most of the time – every angle I tried ended up having brush in the foreground. In the end couldn’t do much about that, but for the most part was able to keep them fairly clean with the exception of the tail area. Time to call it a post – we are heading out for our traditional Valentine’s dinner with a Skunk (yes, a real one). Interesting word “lie” in itself both validating and invalidating at the same time. Take for instance the quote “I never lie”. One must make assumptions just to determine if it is truth or fiction. Follow that up with say a comment like “of course, Ron is a great photographer”, or perhaps “yes dear, you look great tonight” and you are pretty much left with a quandary hehehehe. I do not willingly lie, more like a few facts may not get stored correctly due to serious damage to the body during my martial arts years. I do remember getting my facts wrong on an Ibis post stating it was named after a woman who was stricken with grief after witnessing a plague doctor carrying her dead husband out of the house. She cursed them yelling “I piss on your grave”. A famous birder overheard this shriek incorrectly and associated it to the Ibis which also has a downturned bill. An innocent misunderstanding of fact ha. I think you are right about Hawaii – need to get that trip booked soon. Thanks for dropping by (definitely not a lie). Actually I like the sound of evil cardinal, even if it’s not true keep it anyway. Ha, will do – it does have an much more authentic ring to it and you do not have to know Greek to know what it means! Thanks for dropping by – have you entered that incredible Marbled White in any contests yet! I think your first and third pictures are very nice, indeed! 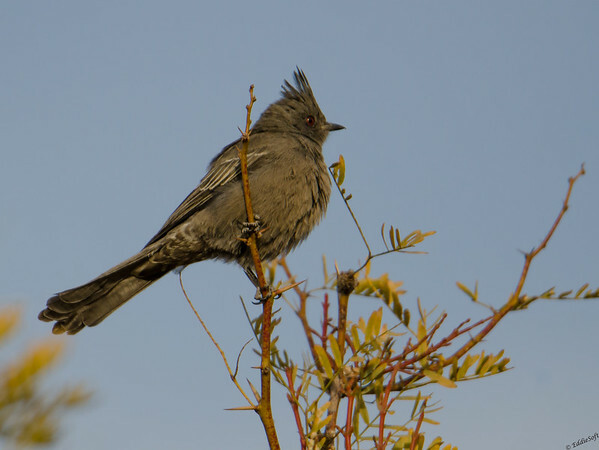 I believe you had the pronunciation of this bird spelled out in your talk to the Peoria Audubon Society –“Phainopepla” (pronounced fay-no-PEP-la). I was pronouncing that “e” as a long “e” before that–now it sounds less like a skin rash. Also, in the woodlands (where they turn from solitary to very social) they mob nest predators such as the Western Scrub-Jay, which makes them OK in my book. It is sad but true that the American Birding Association, which runs the Big Year competitions in the US, included Hawaiian birds as US birds last year. So unless Brian accedes to my proposed modification to our birding rules to limit countable birds to the continental US, he will increase his bird count beyond belief when he gets there. Thanks for the post! I actually went back to see your previous post on them. Speaking of evil bird names, you can’t beat the Satanic Nightjar. Wow, I think your comment just might be longer that my post! I never did see those white spots and I was able to see it fly a couple of times. Next time I encounter the Evil Cardinal I will make it a point to get that perspective. You are not supposed to say things like that about Linda – it goes to her head and she gets all diva like – and for the record, she is the one who found the dinner with a skunk opportunity and originally asked if I wanted to go – let me see, 5 course dinner, free drinks and wait for it, wait for it, dinner with a s-k-u-n-k, that would be a big “hell yes I want to go”. Note, there was an issue this year which I’ll bring up in my next post. Yes, I practiced and practiced saying the name of that bird so I wouldn’t embarrass myself in a room full of birding experts. After all that studying I can spell and say that name with absolute ease now – of course that Pyrrhuloxia is still giving me fits. Thanks for the additional info on the bird! I was stunned when the ABA added Hawaii into the official countable list. I was just as sad to learn that they also removed California. I felt bad for you, but rules are rules (I hope Paula doesn’t see that last line, I may have my facts mixed up a bit on that). Nice comment, appreciate the time to help educate all of us. As the “teaser” referred to in the opening, I’d be happy to be a remote correspondent, on assignment from the islands next summer. Especially if it helps me get larger glass in the process. As you have said many times, you never know what will present itself, so you photograph everything in range and sort it out later. Being lucky sometimes is better than being good. Hi Brad!! Thought you might recognize the subject of the teaser. Maybe when you get back you can do a guest spot here at Intrigued and tell us all about the finds in that tropical environment. I am still discussing the rule nuances with Ron regarding whether I can count +1’s if I am not physically there, but I happened to loan my equipment to someone. This sounds very similar to the other nuance we discussed as to whether you should get credit for seeing a particular bird if you are video conferencing someone out in the field and that person would happen to point the camera at said bird. Quite the quandary. Definitely agree with the note about being lucky – if you come right down to it, unless someone brings you a bird with its feet nailed to a perch (yes, a Python reference) you are basically playing dice with the weather and a brief moment in time when that bird happens to venture into your field of vision. Note, I actually thought you were going this Summer. Thanks for dropping by and stepping out of the shadows (readers should thank Brad, he has a knack for catching my grammar and typo errors not to mention takes time out to catch my public speaking engagements).